CHICAGO, Oct. 3, 2013 /PRNewswire/ -- United Airlines today unveiled a new, signature seat design focused on customer comfort and environmental responsibility, with a sophisticated, modern look. The company will deploy the new seats on hundreds of aircraft that fly within the United States, Canada, Central America and the Caribbean. The airline is introducing the new design today with a Bombardier CRJ700 operated by United Express carrier SkyWest Airlines. United expects to deploy the new look on its domestic mainline aircraft and on regional aircraft operated by United Express carriers. Ultimately, United plans the new design to be on more than 60,000 seats on more than 500 aircraft, including, United anticipates, approximately 400 aircraft by 2015. "Our customers will see a distinctive, consistent look on our aircraft that underscores our modern fleet and our onboard investments to make their travels more user-friendly," said Jeff Foland, United's executive vice president of marketing, technology and strategy. 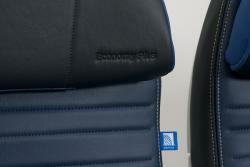 The airline developed the seats with global travel and transport design consultant Priestmangoode. Photos are available at http://newsroom.unitedcontinentalholdings.com/seatredesign.